HON. EDWARD ROESSLER. In this sketch we present to the attention of our readers a short record of the life history of a man who is well known in Shelby County, not only on account of his honorable war record, but also as the former representative of this district in the Legislature of the state of Illinois. We also invite the attention of the reader to his portrait on the opposite page. His father, Christian Roessler, was born in Wurtemburg, Germany, and came to America in 1815, locating in Lancaster, Fairfield County, Ohio. He learned the trade of a wagon-maker in the Old Country and pursued that business at different places in Europe. A skilled and competent workman, he earned an excellent reputation for thoroughness and efficiency. Upon coming to Lancaster, Ohio, he engaged in business for himself, and his work was noted far and wide for its excellence and completeness. He continued thus employed in Lancaster until 1832, when he sold out and purchased a farm in Fairfield County, where he turned his attention to farming and made it his home until 1849. During the year just mentioned Christian Roessler sold his farm in Ohio and emigrated to Illinois, settling in what is now Rose Township, Shelby County. There he continued to live until his demise, which occurred in September, 1861. His marriage in Lancaster united him with Elizabeth Miller, who was born in Hesse-Cassel, Germany, in the year 1799. She lived until July, 1871, when she passed away in Rose Township. Both Christian Roessler and his wife were earnest in their religious life as members of the Lutheran Church. He ever took an active part in local affairs and was efficient in helping to build the old Indianapolis & St. Louis Railroad when it passed through Shelby County, and was a stockholder in that company. He had a family of four sons and two daughters — Reuben, Edward: Regina, who is the wife of B. Christman; Andrew; Philip, and Elizabeth, who is the wife of Charles Pfeiffer. Lancaster, Fairfield County, Ohio, is the native town of our subject, who was born January 13, 1825. In that town his early years were passed, and he was about nine years old when his father removed to the farm, where the boy grew to manhood, alternating his attendance at the district school with the healthful pursuits of farm life. He continued to remain at home until he had reached his majority and then enlisted, in 1846, with his brother Reuben, in the United States Army for service in the Mexican War. Edward became a member of Company B, Fourth Ohio Infantry, and was in service all through the war. The most important engagement in which he took part was the battle of Monterey. He was mustered out of the service at Cincinnati, Ohio, and returned to Lancaster, the same State. The young man had determined to come West, and in the spring of 1849 he removed to Shelby County, Ill., with his father's family. He bought about two hundred and forty acres and his father some five hundred acres, all of it in Rose Township. During the season he set about improving his land and preparing to establish his home in the new country. During the latter part of the summer he returned to the old home in Fairfield County, Ohio, and was there married August 5, 1849, to Anna Stumpf, who was born in Verden, Hanover, Germany, her birth occurring February 11, 1831. She was two years old when she came with her parents to Ohio, her father being Gearhart Stumpf, and her mother's maiden name being Catherina Luehrs. The mother died of cholera in Cincinnati, Ohio, in 1848, and the father did not long tarry, but passed away after reaching Rose Township in 1852. Mr. and Mrs. Roessler are the parents of twelve children, namely: Reuben, who died in infancy; David, who married Charlotte Wetzel; Solomon, who married Susie Kellogg, and is a military engineer in the Regular Army; Charles, a farmer, who married Emma Wetzel, now deceased; John, who took to wife Anna Harbour and is a professor in Valparaiso Normal School; Anna, now the wife of George Wendling; Amelia, who married Edward Wagoner; Clara, who is Mrs. Adolph Reiss; Charlotta, the wife of William Zollinger; Minnie, who is engaged in the Hoopeston College, of Hoopeston, Ill., as a teacher of vocal and instrumental music, in which she is very proficient; George and Henry. 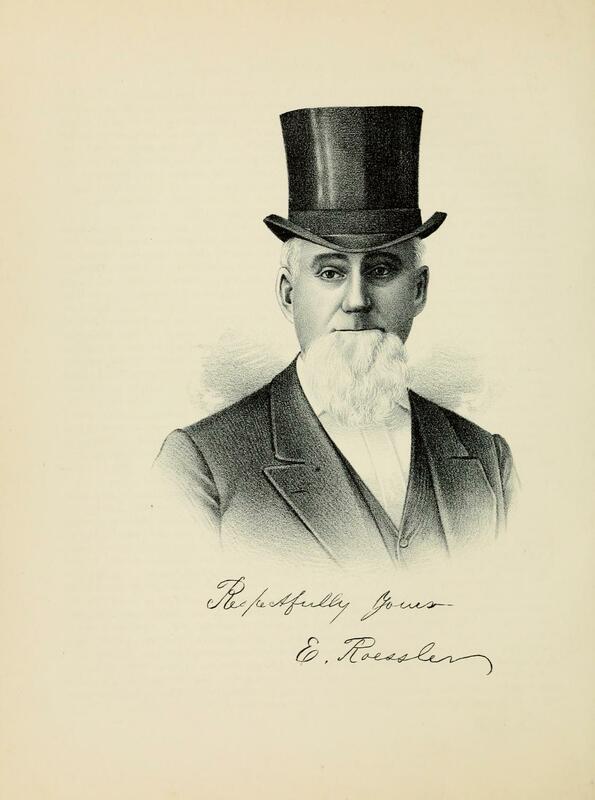 On the breaking out of the Civil War Mr. Roessler took an active part in forwarding enlistments, and himself raised an independent company, of which he was commissioned Captain. His company was assigned to the Fifty-fourth Illinois Infantry, and he afterward raised two companies, which were assigned to the same regiment. In consequence of his energy and zeal he filled the office of Colonel, although not regularly commissioned, and remained in that position until he resigned in November, 1862. In the fall of 1870 the subject of this sketch was elected to the Twenty-seventh General Assembly of the State of Illinois. He filled this responsible position with ability and satisfaction to his constituents, and has continued to take an interest in political matters, especially in local movements. He was elected the first Supervisor of Rose Township, after the organization of that township, and served in that capacity for about ten years, and for several years was Chairman of the Board. Both Mr. and Mrs. Roessler are prominent members of the Lutheran Church and are active workers in its schemes of benevolence. They are liberal contributors to all church purposes and helped generously in the project of constructing a new house of worship. Our subject's chief business in life has been the pursuit of agriculture and he is now the owner of two hundred and forty acres, upon which he has placed good improvements, including excellent and commodious buildings. Extracted 07 Apr 2017 by Norma Hass from 1891 Portrait and Biographical Record of Shelby and Moultrie Counties Illinois, pages 205-206.